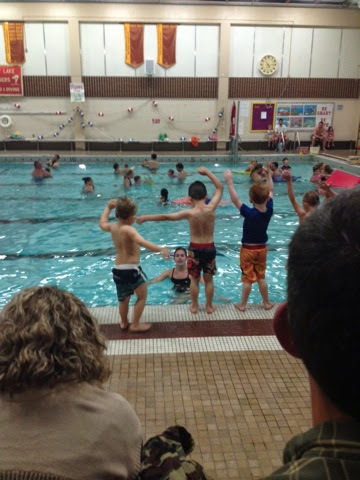 Deacon just started his second round of swimming lessons. This was his first time doing lessons without me in the water with him. I thought I signed him up for the beginner class but apparently put him in a little more of an advanced class with mostly 4 & 5 year olds but it ended up being great for him! He is ALMOST 4 anyway. 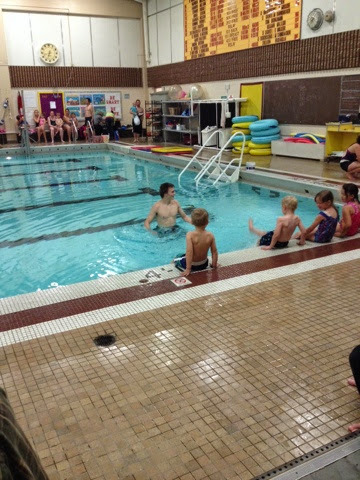 When I was looking at the class he should’ve been in half the kids were holding onto the side of the pool screaming and crying for their parents. Deacon definitely likes the water and is comfortable in it.. he just doesn’t know how to swim without a floaty yet. 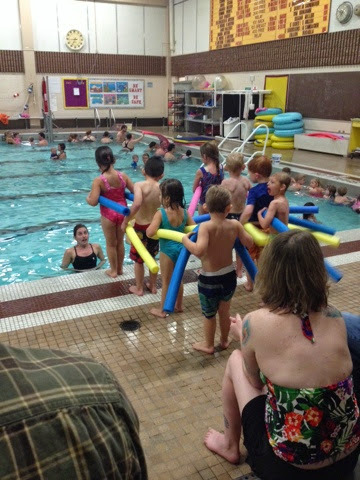 They lined them all up and had them jump in to the instructors and then worked on their floating skills. Deacon didn’t quite get why he wasn’t supposed to be kicking during that but hopefully he’ll catch on. They also wanted them to all practice dunking their heads underwater and that was the one thing he didn’t want to do. I’m guessing he’ll have to be able to do that in order to pass through this level. Deacon also had a hard time remembering to WALK next to the pool since it’s slippery wet and can fall easily. Well of course you can guess what happened.. he fell pretty hard right in front of the bleacher full of parents. I heard a few gasps from the parents because he hit his shoulder pretty hard but what does he do?!? Pops up and says “I’M OK!”.. haha that’s my boy! I knew he was either going to say that or cry.. I’m glad it was the latter J Needless to say he learned his lesson and will now WALK, not RUN. I was so proud of how well he did at his first lesson as a BOBBER.. hoping this week goes just as well!